A Riot Style exclusive scoop! 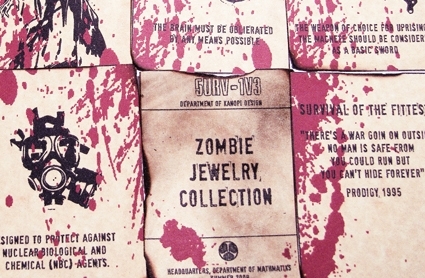 Here is the feature we promised you on Mathmatiks’ Fall/Winter 2008 line of Zombie Jewelry. Influenced by the Zombie Films of George Romero and a survival-at-all-costs mentality, this collection comes shipped in a tiny wooden crate to house all your Zombie fighting gear. The entire collection is 24K Gold plate. Full pics after the jump. Here’s a quick preview of Mathmatiks Fall / Winter ’08 line of jewelry. 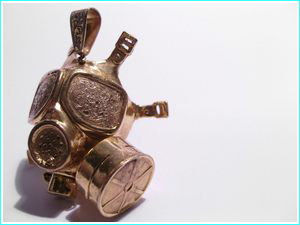 The collection will feature a Zombie themed assortment of gas masks and other paraphernalia.